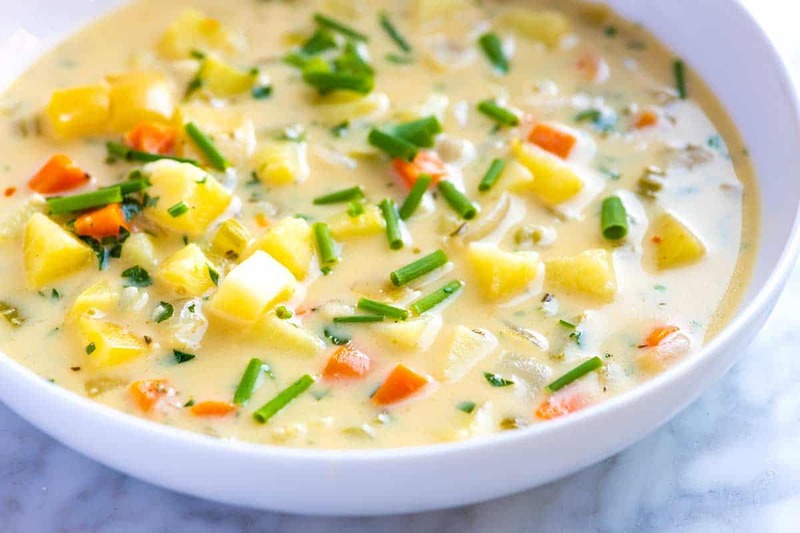 You will love this easy homemade potato soup with potatoes, veggies, garlic, and a creamy broth. The soup is comforting and loaded with flavor. Jump to the Easy Homemade Potato Soup Recipe or read on to see our tips for making it. We’ve already shared our Sausage and Potato Soup with you. Now it’s time to share this easy, creamy, and luxurious potato soup. Potatoes: You can use any type of potato, but we highly recommend using Yukon Gold potatoes. There’s no need to peel them, and when cooked, they are buttery and almost melt in your mouth. We use Yukon Gold potatoes to make mashed potatoes, too. If you cannot find them, baby red or white potatoes, as well as russet potatoes, will work. 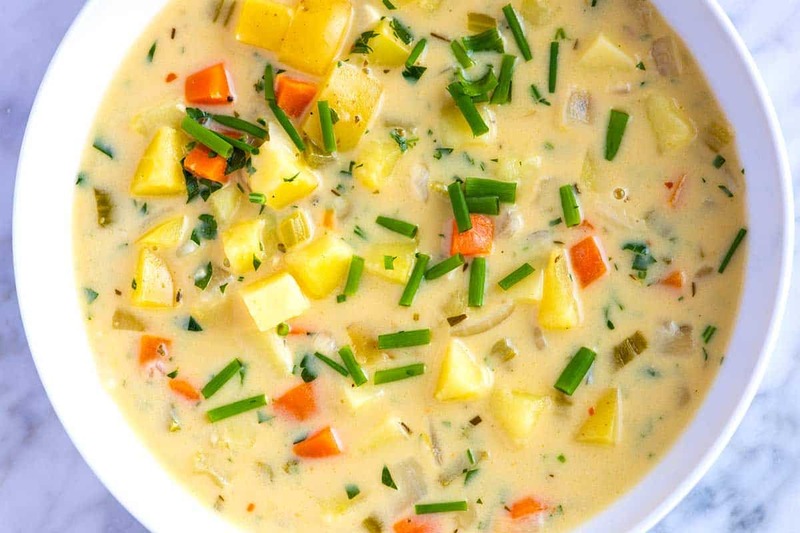 Veggies: Sure this is potato soup, but we love to add a few cups of extra veggies. Onions are a must, carrots add color and some sweetness, and chopped celery add flavor and texture. Butter and Flour: It’s the combination of butter and flour that thickens the soup. We like to use unsalted butter for this and then adjust salt to taste when making the soup. That said, salted butter will work if that is all that you have. If you need the soup to be gluten-free, no problem! We’ve added tips for omitting the flour in the recipe below. Stock/Broth: For the most flavor, use a good quality chicken stock from the store or use homemade. When reaching for store-bought broth, we go for low-sodium. We also look for a store-bought broth that’s darker in color (usually means more flavor) and since it usually has more of a backbone, we like to buy boxed bone broth (we use homemade bone broth sometimes, too). Cream: We add a little cream at the end of cooking. The chicken stock adds flavor, and the cream makes the broth creamy and more luxurious. Using cream isn’t the only option, though. Try half-and-half, sour cream, cream cheese or plain yogurt in its place. Cheese: Cheese is an optional ingredient, but if you have some on hand, it adds a lovely richness to the soup. For soup that rivals cheesy baked potatoes, use sharp cheddar. We also love stirring in gruyere (we use this when making mac and cheese), and parmesan adds lots of flavor. Making potato soup from scratch is simple, and it all happens in one pot! Here’s an overview of how to make it (the full potato soup recipe is below). Cook onions, carrots, and celery in butter until soft. Stir in the garlic, rosemary, and other spices. Add the stock then bring to a low simmer. Add the potatoes and cook, partially covered, until tender. Stir in the cream and cheese. 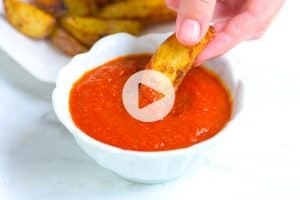 Taste for seasoning, and then serve! There are two ways to serve this soup: brothy or thick and blended. We love both and making them is the same except for the last step. For a thick, luxurious, and blended soup use a potato masher or immersion blender to puree or mash about half of the potatoes in the soup to thicken it. If you have leftover potatoes, make potato salad! For the morning, try grating a potato and adding it to scrambled eggs. That’s what we do when making our easy breakfast tacos with potatoes and peppers. Potato soup is absolute comfort food, but so is this ultra-satisfying chicken noodle soup recipe (it’s so good!). 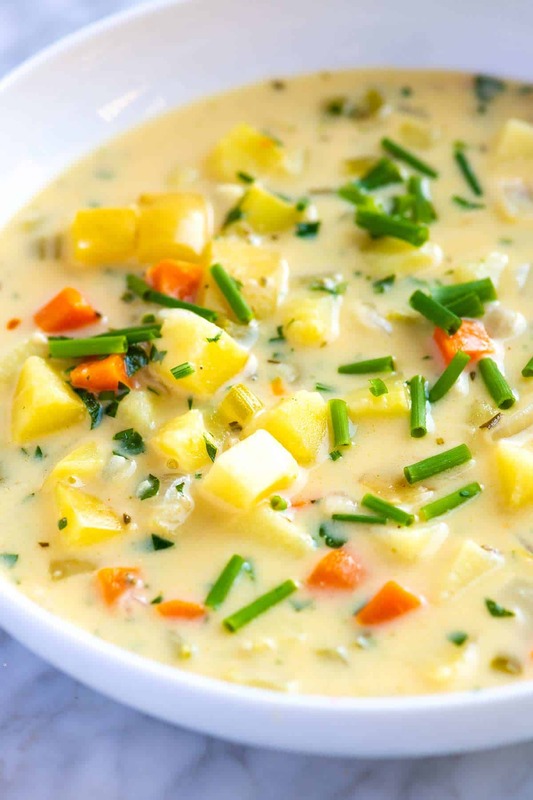 We use potatoes as a base for our creamy vegetable soup. It has lots of 5-star reviews. 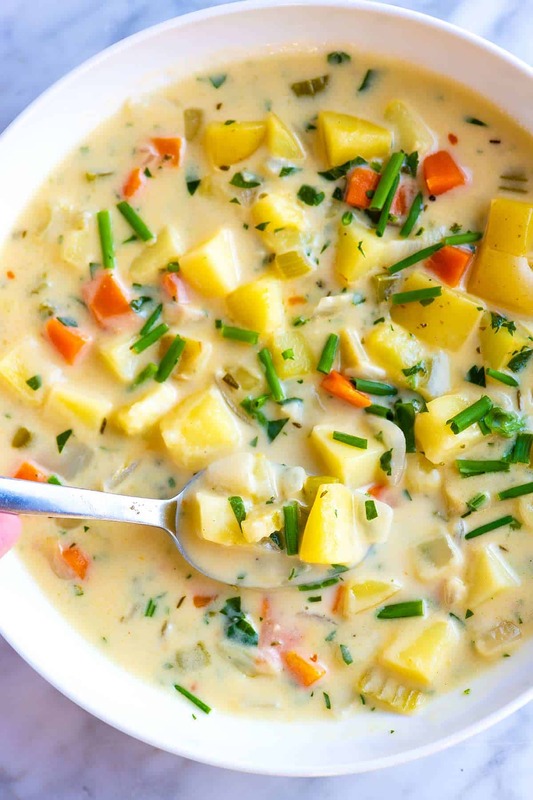 You will love this easy homemade potato soup recipe with potatoes, veggies, garlic, and a creamy broth. The soup is comforting and ultra-flavorful. For the best potato soup, use Yukon Gold potatoes. They have thin skins, so it is not necessary to peel them. They also become buttery and soft when cooked. There are two ways to serve this soup: brothy or thick and blended (our favorite). We love both and making them is the same except for the last step. For a thick, luxurious, and blended soup use a potato masher or immersion blender to puree or mash about half of the potatoes in the soup to thicken it. In a large heavy-bottomed pot (like a Dutch oven), melt the butter over medium heat. When the butter is melted, stir in the onions, carrots, and celery. Cook, stirring occasionally until they begin to soften; 5 to 6 minutes. 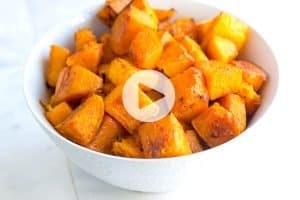 Stir in the garlic, rosemary, red pepper flakes, 1/2 teaspoon of salt, and 1/4 teaspoon of black pepper, and then cook, stirring everything around the pot, for 30 seconds. Scatter the flour over the vegetables and cook, stirring, until it looks medium blonde in color; about 1 minute. It smells toasty, like browned butter. Slowly whisk in 2 cups of the stock, making sure there aren’t any lumps of flour. It will be thick. Pour in the remaining stock and whisk until blended. Increase the heat and bring the soup to a boil then reduce to a simmer. Add the potatoes and bay leaf, and then cook, partially covered, until the potatoes are fork tender; about 20 minutes. Turn the heat to low, remove the bay leaf, and then stir in the cream and cheese. Taste for seasoning then adjust with more salt and pepper as needed. Serve with fresh herbs on top or for a thick and blended soup, use a potato masher to mash or an immersion blender to blend about half of the potatoes in the soup (this is Joanne’s favorite way to serve the soup). 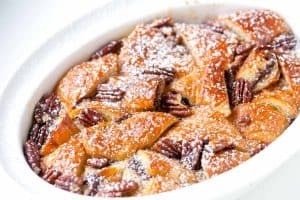 Make it gluten-free: Do not use the flour and instead whisk a tablespoon of cornstarch into the cream (or use milk) and add it to the soup (the cornstarch acts as a thickener). Or leave out flour and the cornstarch and blend about half of the soup to thicken it. Great soup! Doubled the recipe to have leftovers. I used slightly less red pepper flakes than what is called for but really liked the little bit of kick they give. Mixed in some gruyere. Hi there, we have never done this, but thanks for the tip! We got our CSA box today so we had everything we needed to make this soup for dinner. It came together really quickly and was super tasty. My husband especially liked the little kick of heat from the red pepper flakes. We did use purple carrots so the broth ended up a weird purple-grey color, but that didn’t bother us at all. Thanks for the recipe!